Miles Peterson was a man who had it all: wealth, status, success. Still, something was lacking. Then, in his darkest hour, the words of a single Book gave Miles Peterson the burning desire to know God. Now, transformed by the Word of the Lord and empowered by His strength, Miles Peterson lives out a pledge to fight evil in the name of God as Bibleman.^^In this latest Bible Adventure, the infamous Luxor Spawndroth uses the first name in villainous software, "Hypno Hack by Micro Harsh" to tempt Bibleman's trusted friend Cypher and young school girl Riley Watson into going back to their old life styles of unkindness. With help from Bibleman, Biblegirl and the Word of God, they find out that God will give us a way to escape temptation (1st Corinthians 10:13).^^This action-packed adventure takes you from an amazing battle in the forest to a final bout in Luxor's lair!^^Has Luxor Spawndroth's hypnotic web site snatched young Riley? Will Cypher be tempted into hanging out with an old but dangerous friend? Find out, in this latest Bibleman adventure: Lead Us Not Into Temptation^^Great For Kids Ages 5-93! 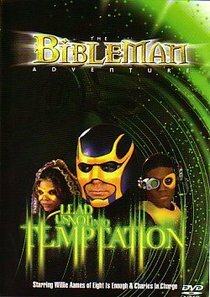 About "Bibleman: Lead Us Not Into Temptation"